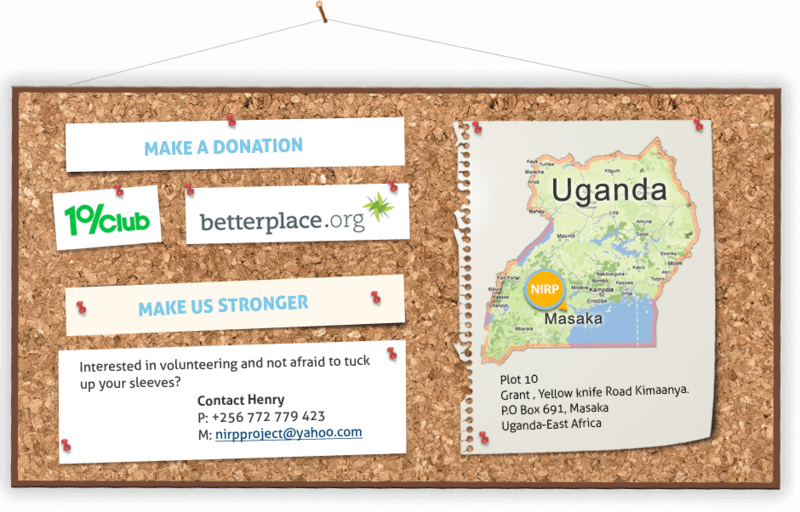 NIRP (Ndibwami Integrated Rescue Project) is a grass root organization empowering communities in (Greater) Masaka to achieve a holistic and sustainable development in their response to the challenges brought by lack of education, HIV/AIDS and psycho- socio-economic obstacles. The founding team met informally in Kimaanya Church Compound to provide mutual psychological and material social support. Cohesion among the members was strengthened by the fact that they were challenged by poverty and HIV/AIDS or implicitly affected because their very close family associates were infected. One distinguished feature about the founders was that they voluntarily used their time and other resources to support people living with HIV, carrying them to the hospital and sometimes providing basic material and psychosocial support. 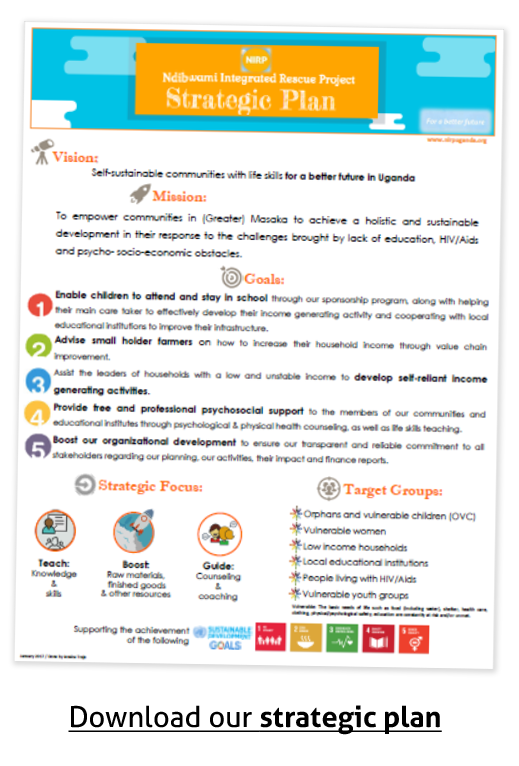 To empower communities in (Greater) Masaka to achieve a holistic and sustainable development in their response to the challenges brought by lack of education, HIV/Aids and psycho- socio-economic obstacles. Enable children to attend and stay in school through our sponsorship program, along with helping their main care taker to effectively develop their income generating activity and cooperating with local educational institutions to improve their infrastructure. Advise small holder farmers on how to increase their household income through value chain improvement. Assist the leaders of households with a low and unstable income to develop self-reliant income generating activities. Provide free and professional psychosocial support to the members of our communities and educational institutes through psychological & physical health counseling, as well as life skills teaching. Boost our organizational development to ensure our transparent and reliable commitment to all stakeholders regarding our planning, our activities, and their impact and finance reports. Successfully run our sponsorship program to benefit at least 10 OVCs every year. Also, to annually support at least one partner school to improve their infrastructure. Advise 1000 small holder farmers on how to increase their household income through value chain improvement. Assist the leaders of 100 households with low and unstable earnings to develop self-reliant income generating activities. Offer counseling and coaching programs to all our targeted communities and educational institutions in a systematic and planned way. Establish systems & procedures for all our activities/projects: yearly/monthly planning, keep clear and organized records of their impact & follow-ups, hold at least once a month a team meeting and keep a strict, transparent & reliable finance monthly reporting.